Oops - we don't appear to have a video for the ScanJet 4500 FN1. Purchased this equipment March 2016; The sales aftercare team were attentive and very helpful and after a few teething problems (due to my technical ineptitude). Which Andy from the support team sorted out in super fast time. I can now report that it is proving to be worth it's weight in gold. Very pleased with this scanner and would recommend the seller. Get fast two-sided scanning with a network scanner recommended for 4000 sheets per day. Digital sending is easy from the touchscreen via wireless network or Wi-Fi Direct. 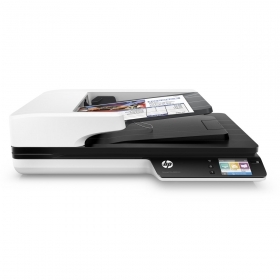 Send scans to mobile devices using the HP JetAdvantage Capture app. Send scans right from the scanner to email, network folders, or a PC via a gigabit Ethernet connection. Send scans through the network with security protocols and to mobile devices via Wi-Fi Direct. Remotely monitor and manage jobs, and enable security settings with the embedded web server. Scan directly to mobile devices with the HP JetAdvantage Capture app, then edit and save files. Scan images directly into applications with included and full-featured Kofax VRS Pro, TWAIN, and ISIS. Capture and organize documents, business cards, and other file types with feature-rich software. Accurately capture text from documents for easy editing with HP Scan and I.R.I.S. Readiris Pro OCR software. Define scan profiles for common document types, and scan to multiple destinations with HP Scan software.